The youngest generation of Top Enders has been thrown a challenge to get creative and make a piece of art about the ways their family is waste-wise and how to create a waste-free future. 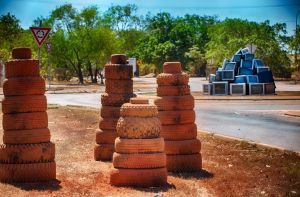 As part of the City of Darwin’s war on waste, the art competition aims to encourage children to start thinking about, and acting to reduce waste. Darwin council engagement manager Sheree Jeeves says Darwin is lagging behind the rest of the country when it comes to how much we recycle. “We’re performing really poorly as far as waste management goes, with only 12 per cent recycled, so that’s 88 per cent that goes to land fill,” she says. Other cities around Australia have up to a 60 per cent recycle rate, and there are plenty of families in Darwin who are already doing their part. “People are really passionate about this,” Jeeves says. “Some people are composting at home, others are getting right into recycling soft plastics – which is quite new for Darwin. All types of artwork are encouraged, including drawing, painting, printing, sculpture, photography and digital art. Artists can submit work individually or team up with friends or classmates and submit a group work.